It was a time to pack and travel north tracing the chocolate smell. On a nice mild autumn day we jumped on the train and headed north to York. It is just over a couple of hours from London to the chocolate capital of England. The history of the chocolate here started by the Quakers who in days had the Rowntree and Terry's chocolate factories. 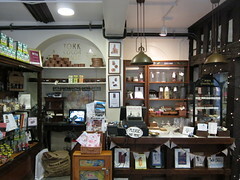 Besides following the York's Chocolate Trail as was recommended to me by Sophie from York Cocoa House. I traveled to watch the play Blood and Chocolate. This play tells the story of the soldiers from York who fought during the I World War and received one Christmas a chocolate tin from the Lord Mayor of York. The story took us through the streets of York and the buildings and monuments of the city acted as the setting. So what there is to do? Many people told me I have to try Betty's. Betty's is a cafe still run by ancestors of the founders who migrated here from Switzerland. The place is the way a real English Teahouse should look like, but in the taste of the cakes and looking carefully in the menu you can see the Swiss influence. We visited here on a Monday afternoon and the place was packed, I wonder how the place look like on the weekend. They have 2 cafes in York plus a few more in others towns in the North West. 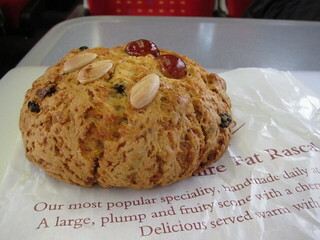 The famous cake here is the Yorkshire Fat Rascals. It doesn't look very appetising to a non English eye at the first eye. So I decided to keep it for my return train journey. I was amazed how moist and lovely that cake is. There are 2 chocolatiers, 1 cafe that sells huge choice of English chocolate bars (besides Betty's that stock their own brand), 1 chocolate experience (new style museum) and several confectionary stores spread all around the city. York Cocoa House was open by Sophie a couple of years ago. They have a good size seating area and they service drinks and food. Sophie mentioned to me that they a monthly chocolate supper club so check with them if you fancy to taste food infused with chocolate. Hairy fig is a little cafe (there's also a deli next door with the same name) that is a good place for lunch. The cafe is at the back of the shop and at the front they sell chocolate and coffee. Licc suppose to be the best ice cream in York. Not that there are many ice creams hops around. I didn't have the chance to try their ice cream. Monk Bar Chocolatiers proud to sell only their own produce. They got 2 shops I visited the little shop in the Shambles (one of the main attractions of York). York's Chocolate Story is a guided tour through the history of York's chocolate and by interactive means and big screens show how chocolate is made. It's advised to book the tickets in advance as it's a guided tour you'll have to join a specific time slot and could be busy especially on school holidays. If you travel all the way here. There are few others things not related to chocolate you could do. Including walking the wall and visiting the interesting National Railway Museum. Also several people offer ghost tours and those tours seem very popular. We had over 50 people on our tour. The tours start between 7:30pm to 8:30pm. If you plan to visit many attractions you might want to buy the York Pass. York Tourist Information website consist a lot of vital information about the city.